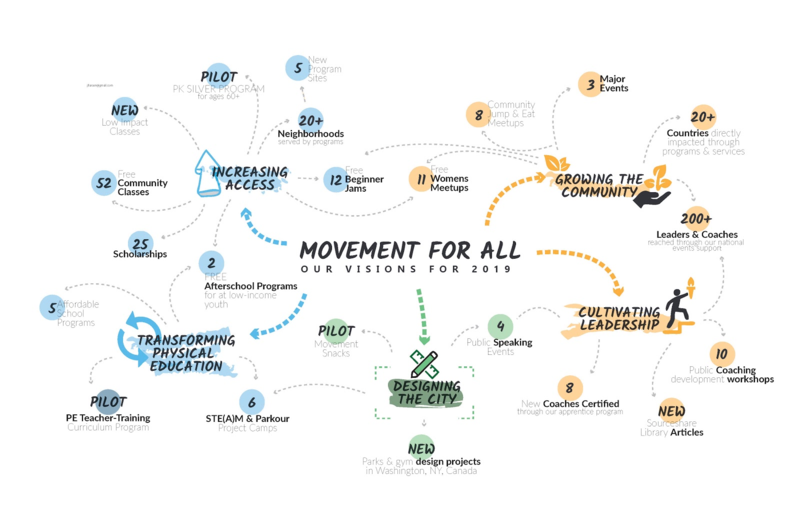 The #MovementForAll Fund will increase quantity, access, and affordability of parkour programming, not only here in Seattle, but also regionally and nationally. Our community goal is to raise $25,000 by 11:59pm on Sunday, February 24th, 2019. A small group of dedicated practitioners and families passionate about parkour have pledged to match every dollar we raise, up to $25,000! Donate today to double your impact and help create movement for all! The majority goes to expanding and increasing access to existing classes, upgrading and providing playground equipment, and establishing programs for new populations in 2019. The remainder supports community events, coach development, resource sharing, and administration. More concretely, we will increase the number of classes, program sites, and number of students served, specifically targeting neighborhoods and populations that have previously had limited access to parkour. See the full plan for the Fund here [LINK]. We are a 501(c)(3) charitable organization, EIN 26-1856160. All the contributions are tax deductible, minus the value of any perk received as a result of your donation. No goods or services will be provided in exchange for the contribution.